Situated 20km from Mahon in the North east, Arenal d'en Castell is an attractive purpose-built resort set on Minroca's dramatic northern coastline. 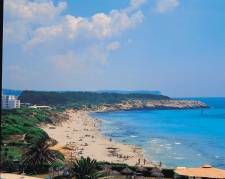 The resort cascades down the steep slopes of a near circular crescent-shaped bay and is backed by sand dunes and swathes of verdant pine woodlands. 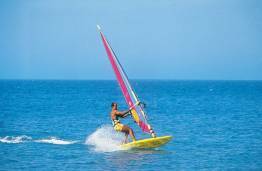 Lively Arenal d'en Castell is particularly popular with families and young couples. The peak of Monte Toro offers an ideal vantage point from which to take in the delightful scenery of the island. 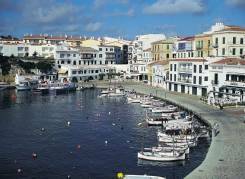 Move further north and you can get away from the modern world at the Bay of Fornells, a fishing village renowned for its authentic Minorcan cuisine, fresh from the sea. And what better place to relax at the end of the day than the Queen of Bays, Cala Galdana, widely considered to be one of the most beautiful coves in the western Mediterranean. Without a doubt, the main attraction of Arenal d'en Castell is its glorious beach. 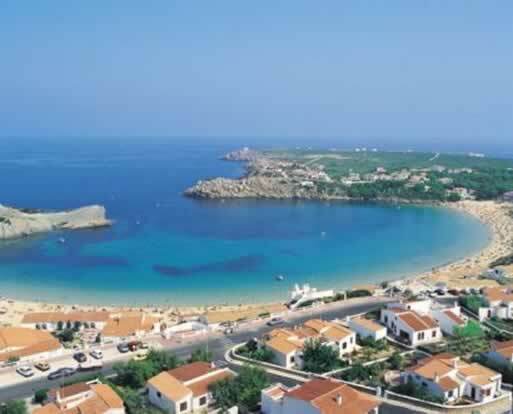 Made up of soft, golden sands it curves around the long sweep of the bay and offers safe bathing for children and has a good range of watersports including pedalos water skiing, hire motorboats and windsurfing. The water is shallow, ideal for children and there is also a first aid post. Arenal d'en Castel has a host of shops in the centre of the resort for all of those holiday essentials, and a new shopping centre on the outskirts of town. For a more comprehensive range of shops, head to the island's capital Mahon or alternatively head across to Minorca's western coast to the historic town of Ciudadella which is home to a wide selection of traditional shops and elegant boutiques. Arenal has several bars including an Irish pub. With some of them opening late, you'll never be short of things to do once the sun has set over the azure waters of the Mediterranean. There is also a selection of restaurants. The resort offers a wide range of restaurants, from Chinese and Italian to traditional Spanish dishes.